· Accomodation for foreing crews at the BISC with special rates. Please forward this info to your fleet, boat charter available under demand! This years Danish Nationals were held at picturesque Svendborg Sound. Saturday with lots of sun saw winds blowing 12-16 knots from a northeasterly direction increasing Sunday to 15-20 knots in a more gray weather setting. A combination of land-effect, current and a shifty breeze provided the competitors quite challenging conditions in both tactics and boat handling. Please find full results and pics below. Testing conditions greeted the 56 crew on the first day of racing in the strong turnout of 28 Hobie Cats competing in this year's Channel Islands Hobie Cat Championships organised by the Royal Channel Islands Yacht Club. With a westerly wind gusting to 27 knots throwing up a choppy sea, there was lots of action in the 3 races programmed for the Saturday in St. Aubin's bay. 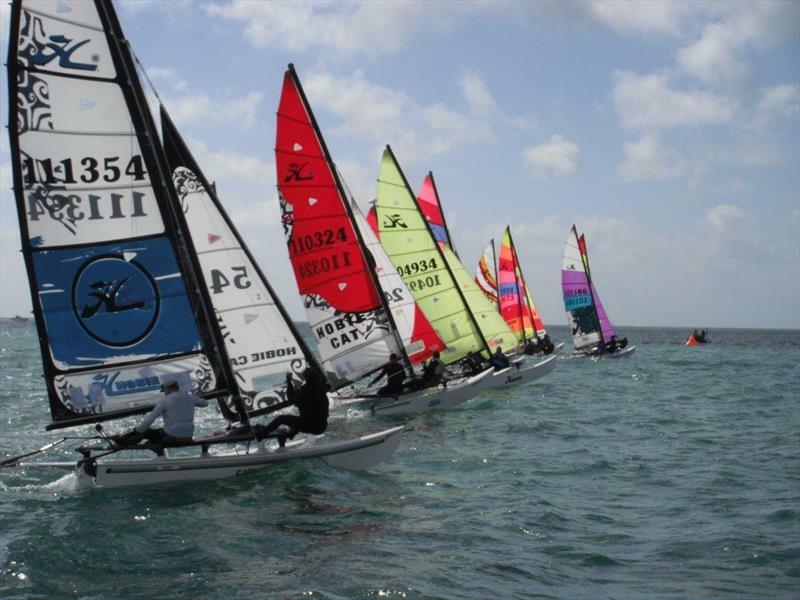 The highest turnout was in the Hobie 16 'A' and 'B' Fleet class with 17 boats competing for the trophies. The Hobie 18ft Tiger and Wildcat class saw Jersey and Guernsey crews performing well on their powerful multihulls in the tough conditions. Due to the strong wind the Junior Hobie Dragoons crews were unable race on the first day and several of the Hobie 16 'B' Fleet retired after some spectacular capsizes. Sundays sailing conditions couldn't have been more perfect for the 3 morning races, a steady force four north westerly wind direction flattened the sea and allowed all classes to double trapeze and sail fast on the long tactical courses set by Race Officers Tony Eggleston and Mike Winspear. STONEHAGE CHANNEL ISLANDS HOBIE CAT CHAMPIONSHIPS – SAT 30th & SUN 31st AUGUST 2014, ST AUBINS BAY. THE MAJOR HOBIE EVENT of the year. Racing for H/Tiger & Wildcats, H16 ‘A’ & ‘B’ Fleets and Junior Dragoons. There are Trophies and Prizes for the top 3 in each class, plus other discretionary prizes. The Notice of race and entry form is on the website www.rciycjersey.com also available from the Club. The Sailing Instructions are available from next week. Racing starts at 9:30am each day with 3 back to back races for each class and should finish up around lunchtime. If you require crew or a helm please let me know asap. With the record 30 Hobies entering the Summer series, it will great to see a record turnout for this year’s Champs especially with the growing H16 ‘B’ Fleet entering and racing for their own class prizes. IT ALL KICKS OFF next Friday 29th August where there is Registration and Weigh in for all crews from 6:00pm to 7:00pm plus a complimentary drink for all competitors and helpers. On the Saturday a showing of the classic Hobie film ‘SHARING THE WIND’ ( a must see ) is planned at the Club plus photo gallery from the mornings racing starting at 6:30pm. A ‘Fish n Chip’ (best in Island) supper is available or other food from the menu, plus a few cold ones to quench the thirst after the mornings competitive sailing, more info on this to follow. The Gala Prize Giving including hot & cold buffet is on Sunday, for competitors the price is included in the entry fee, helpers are invited. Guest’s tickets are available at £10-00 each for the Sunday. BIG CONGRATULATIONS to Darren and full Hobie crew Rob, Adrian, Rachael, Yvonne and Dan aboard his sailboat Crumpet who took the ‘Speedbird Trophy’ line honours and were first in class I in the ‘British Airways Round Island’ race last Sunday. Because of the strong conditions the Cats were cancelled and half the yachts didn’t sail . The Hobie team pulled out all the stops in wind gusting to 27kts to take the overall honours in a time of just over 5hrs 30mins, a fast rounding for a yacht – their boat speed coming around Corbiere on a wave surge was 15.2kts! THE SPORTS CATS class for the BA ROUND ISLAND race is now re-scheduled for Saturday 27th September starting at 8:00am.